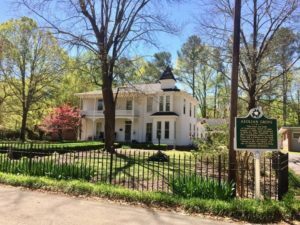 Aeolian Grove, located in Fulton’s historic district near the town square, was built ca. 1842 by the Eckford family from Aberdeen. The home was built of hand-hewn, heart-of-pine lumber. This home is one of Fulton’s oldest surviving residential structures. During the 1840’s the home was sold to the Tannehill family who were recent immigrants from Scotland. The Tannehill family operated a store in partnership with Joshua Toomer at the corner of Main and South Gaither Streets. An 1887 remodel of the home added a second floor, a kitchen was added onto the back of the home, and a connecting breezeway. During the 1800’s Aeolian Grove was also home to the Cates, Baldridge, and Orr families of Fulton. Contact Phil and Mary Morris at 662-862-9827 to schedule a tour.